Hi everyone!! Thanking you all so much for your lovely comments about my new Ossie Clark dress, they are all very much appreciated!! This afternoon, I went thrifting-I know I'm supposed to be 'making do', but I just enjoy the 'me' time and browsing of thrifting. I find it relaxing and inspirational. Well, I thought I really loved the new Celia Birtwell top, it arrived today and does fit, but after my thrifting expedition, I just can't keep a £50 flimsy (but still gorgeous!) top, now I found this little number!! Original vintage 80s Radley dress, £3.49 from the Salvation Army!! This for me is a more of a 'treasure', as I love the vintage appeal and obviously the price helps too! This is soo timeless and I will enjoy wearing this-very Carrie, don't you think!! Anyway, the Celia Birtwell top is going back for a refund this weekend, with not many regrets!! I also got 2 pairs of faded jeans-I couldn't decide between the two and as 1 pair was £1.30 and the other was £3, I just bought both!! Plus I got a divine black velvet H&M blazer, perfect for winter and Xmas outings-this was £5.50. Anyway, hope you all have a stress free, enjoyable weekend!! Wooo hooooo -- the Salvation Army rocks! Hi always in style-yaay, I seem to get great bargains from them!! Thanks so much my dear! That Radley is a find! Hi Wendy-thanks for your lovely comment!! i'm the same way...when i go shopping alone to browse through vintage finds, it's unbelievably relaxing. that floral dress is amazing...i'd pair it with tights and some rugged boots for fall! Hi Emily-yes, I do enjoy going, especially after being at work, its just so theraputic! Thanks for your lovely comment on the dress too! Hi Couture Carrie-very pleased you approve, thanks my dear! Hi deb-thanks my dear, yes I was thinking that too!! I need to find a Salvation Army near me... I love the florals! I want to see the dress on you - not just hanging on the fence looking lonely! It's very pretty - fabulous work! Its like one of those delicate tea dresses! Such a good find! Hi kate-yup, I agree about the dress, to me, its more of a find. The CB top is lovely, but the material is very flimsy, one wrong move and there would be a tear in the fabric. If it was a more durable fabric, i would have kept it, but too floaty and flimsy, I'm afraid!! Hi shen shen-thanks a lot, do hunt one down, haha!! Hi Skye-thanks and haha, I'll wear it soon,just too tired to start modelling!! Hi thomas edison-thanks for stopping by with your lovely comment! Hi nay'chelle-yes, very timeless, I think! Thanks a lot! Hi Acielle-always lovely, thanks and have a great weekend too! Wow,it's beautiful! Can't wait to see the whole outfit. Hi styledigger-thanks for stopping by with your lovely comment! Hi raspberry-thanks very much and for stopping by too! Oh what an awesome dress! I totally adore the print! I much prefer the Radley you thrifted, I tried on all the Birtwell Top Shop stuff and it looked nice on the hanger, but didn't look so great on. I didn't like the material either, felt thin and scratchy. That's it, I won't be tempted into Topshop ever again! Hi nic-thanks so much, yes I find a lot of my stuff there!! Hi nadine-thanks and I agree-very summery and timeless, I think. Hi ladies who lunch-spot on with the Celia Birtwell range!! I've ordered 3 items from the last couple of collections and they've gone back because of this problem. Its a shame, because i have liked the styles! Thanks about the dress too! Hi Sharon! The Radley dress really rocks! This is the most beautiful 80s dress I've ever seen - I love the cut! What fabric is it made of? And you're right, it's very Carrie (rhymes LOL). Well, if you find jeans that cheap, it doesn't hurt you wallet if you buy two instead of one! Wait - black velvet blazer?? I've been looking for a thing like that for ages now! You thrifted it, didn't you? So it's not available in H&M stores now? What a pity..
Hi cate-thanks so much my dear! The dress is a viscose mix and it feels like a very soft cotton really. Yes, it was a very good thrift day all round! Your deals are amazing, Sharon. I love the dress, such a great find. Cant wait to see the rest of your goodies! Have a great sunday! Hi Silje-thanks for your lovely comment my dear! have a lovely Sunday! Hi marte-so lovely of you, thanks!! This is a really good and timeless '80s style, unlike the more common super-hideous floral prints that were everywhere in that era (I know -- I wore one for a high school dance. Ugh). 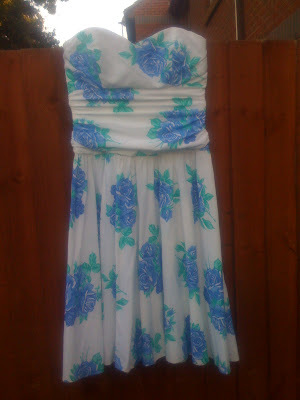 But I do also remember the more subtle and restrained florals of that time, like in this dress, which I found lovely. You're lucky to find it! Hi anchibride-thanks so much for your lovely comment, I also had a few fashion disasters in the 80s too, haha!! Oh my goodness, it's fabulous. When are you going to wear it? Hi lenya-it may be next year now, with our weather-haha!! Hello Darling,how are you? This dress is very Carrie Bradshaw and at such a great price. This dress would look amazing with a fab pair of heels. Another great buy sugar! Hi marian-thanks for your lovely comment my dear, much appreciated! the radley is totally carrie! again, you amaze me with your finds. you should have your own shop! Hi fashion herald-haha, maybe one day I'll have a career change along this line!! Hi vain and vapid-thanks so much for your lovely comment!! Hi angel-oh thats lovely, thanks!! LOVE this dress! Great find! I can't believe what great deals you always get! Hi anjeanette-oh, thanks so much my dear!